The importance of studying and analyzing volume of business and a business’s capability to handle volume cannot be understated. One dissatisfied customer due to overpromised deliverance and underperformance can scar the reputation of a business. Visa versa, meeting or exceeding promised delivery timelines can do a lot of good and bring in plenty of word-of-mouth business from satisfied customers. Queueing theory provides a useful mathematical method for studying and analyzing capacity to meet demand. In this article, we will cover concepts related to queueing theory that make clear its purpose. Life is made of lines–waiting lines. Take a look around your life and you will notice them. We sit in traffic–lines of cars–waiting to get where we are going. We stand in line at the cash register at the store–waiting to make a purchase and leave. We stand in lines at the amusement park–waiting to take a ride. And so on and so forth. Waiting lines in business exist in more than the examples provided above. Assembly lines, by definition, are a line. Lines of components flow down a line and the people and machines responsible for assembling them must be able to handle the number of parts coming to them at the speed at which they come. A network server must have enough processing power to return standard and peak web traffic (requests for web pages and information). An accounting associate must be able to solve financial problems fast enough to satisfy other staff members waiting in line for answers. How is it determined how demand will be met–whether that be roads to handle traffic, cash registers and cashiers to handle store lines, or number of rides to handle crowds? This is what the queueing theory helps to strategize. While we will not be covering mathematical equations here, we will outline business problems and teach you how to start analyzing them. Here, we outline types of queues that businesses should consider to maximize queue efficiency and identify common slowdowns. A waiting line (queue) where a single line of customers go through a single waiting line (phase) and are served by a single server. They wait in line one time for a single service. Example: An ATM. A single line of customers line up in front of a single machine, are served, then leave. They wait in line one time. A waiting line (queue) where customers go through multiple waiting lines (phases) and are served by a single server per phase. They wait in line more than once for different phases of service. Example: Buffet restaurant. A line of customers are formed at each counter of food–one for salad, one for dinner items, and one for deserts. A single server at each counter serves the line for their table. Customers go through multiple lines throughout their meals. A waiting line (queue) where a single line of customers go through a single waiting line (phase) and have multiple servers available. They wait in line one time for a single service and go to the server that is made available soonest. Example: A bank. A single line of customers wait in line to be served once and go to the first bank teller available out of multiple tellers. A waiting line (queue) where customers go through multiple waiting lines (phases) and are served by multiple servers. They wait in line more than once for different phases of service, going to the first available server for each phase. Example: A laundromat. Lines of customers are formed for each phase of completing their laundry–one at the washing machines and another at the dryers. Customers wait in line at each phase for the first available machine. 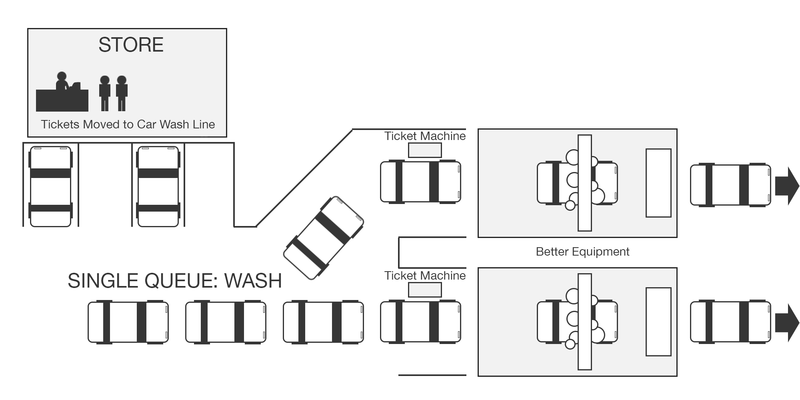 Using an automated car wash business as an example, we introduce the thought process as to what type of queue this business should consider. 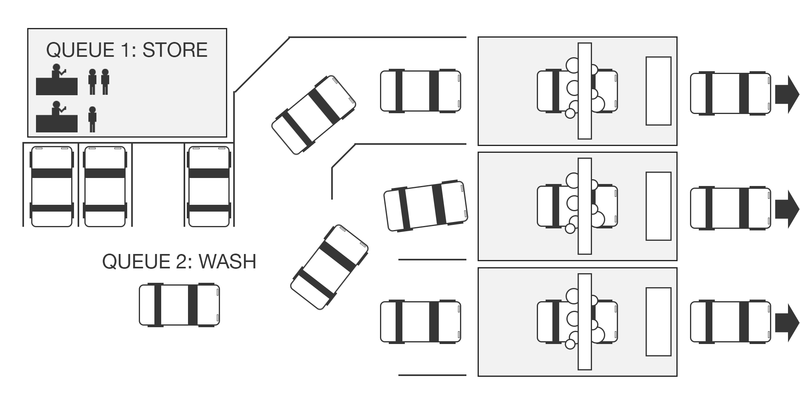 An automated car wash must be thorough, but also fast enough to handle regular lines of cars efficiently without customers losing patience and leaving. The business must consider how many customers arrive on average (arrival rate) and how much capacity should be built into their business. With its current setup, it is a single server, multiple phase queue. Queue 1 is the line for a ticket; Queue 2 is the car line for the wash. 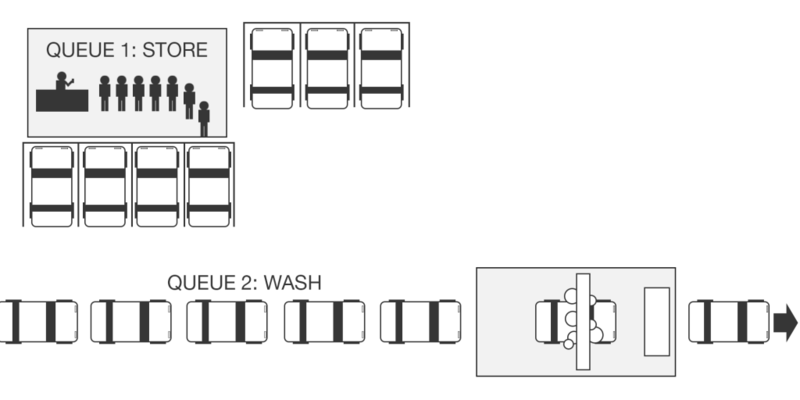 The issue the business is striving to solve is how to adjust capacity to shorten lines at both the ticket counter and the car wash line. The below diagram displays different factors a business must analyze to determine their best queue setup. On the Y axis, we have operating cost–the everyday cost to run the facilities that meet customer needs. 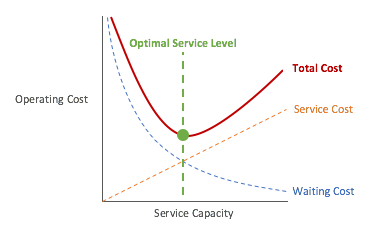 On the X axis, we have service capacity¬–the level of capacity the business possesses to meet customer needs. In our example, operating cost is how much it costs daily to keep the store open, pay employees, pay utility bills, buy supplies, and maintain the car wash machinery. The higher the service capacity (e.g. more bays, more staff), the higher the operating cost. Waiting cost is how much it costs a business to keep customers waiting. The more customers leave without making a purchase or do not return again because of frustrating wait times, the higher the waiting cost. Service cost is how much it costs to provide a service. In our example, service cost is how much it costs per car wash to deliver that service (determined by how many staff members were hired, etc.) and waiting cost is how many customers leave the ticket line or the car wash line because they get tired of waiting–or those who don’t come back because of a long wait. Typically, the more invested into raising capacity, the less customers are lost–decreasing waiting cost. Obviously, adding additional bays–while perhaps necessary–would be very expensive. Paying additional staff-member salaries would also be expensive. However, increasing capacity is not the only way to minimize waiting cost. Another strategy to consider would be increasing efficiency of existing servers. For example, is existing staff fit for their position? Do they need additional training or better tools to increase their efficiency, equipping them to serve more customers in less time? This could eliminate need to hire additional staff. Could the existing car wash equipment be upgraded to increase speed without sacrificing wash quality? This could decrease the number of additional bays needed or the need to add any at all. Assuming the business concluded that the above setup is the ideal for them, they are now a multiple server, single phase queue. There are now two bays (servers) and only one phase necessary (waiting in a single line for the next available bay). There are varying mathematical equations for specifically weighing your cost vs customer arrival times, wait times, and more, to determine what your optimal service level and costs are. Again, we do not cover those here, but we have provided a valuable understanding of the overall concept of and purpose for queueing theory in light of what businesses are up against. Next post: What is Overproduction?